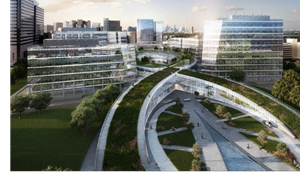 ​ HOUSTON – A new 30-acre research center dubbed Texas Medical Center 3 (TMC3) is expected to establish Houston as an​ international hub for biomedical research. The 1.5 million-sf​ facility will be located just south of Brays Bayou and north of Old Spanish Trail in the Texas Medical Center footprint. The groundbreaking project will generate a $5.2 billion stimulus to Texas and create 30,000 new jobs. The project will break ground in 2019 with estimated completion in 2022.